Princess Elsa is almost ready for her wedding and Anna will be her bridesmaid. This day they will remember for the rest of their lives. Prepare Anna for the ceremony and take care of her face! What could be more exciting, than having a sister as a bridesmaid on your own wedding. Elsa is happy twice more, because Anna looks like a model today. 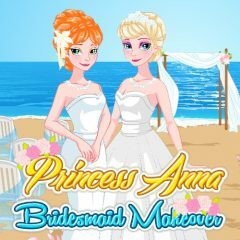 Make this ceremony interesting with Anna's bridesmaid outfit.